Last week, we showed you the first trailer for the new animated Batman adventure entiteld Batman: Return of the Caped Crusaders, which reunites the original Dynamic Duo, Adam West as Batman and Burt Ward as Robin. Today we have the first full trailer with all new footage, along with the Blu-ray artwork. Both West and Ward first teased this project during a convention appearance back in 2015, although very little was known about the movie at that time. IGN debuted the full trailer along with the Blu-ray cover artwork for this animated adventure. 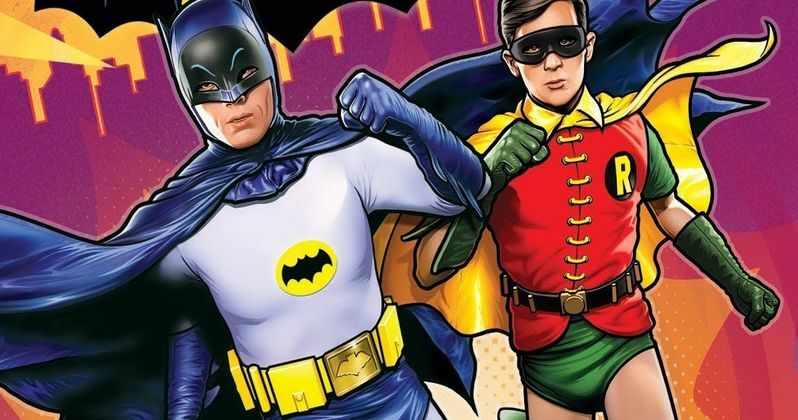 Adam West hinted at last year's convention that this movie could spawn a new franchise, which would make sense since it likely won't be connected to the studio's DC Universe Original Movies, which have its own continuity in place. The trailer reveals that this is a "DC Classic Original Movie," so it seems possible that this could launch a new line of animated films based on classic superhero properties. Warner Bros. Animation and DC Entertainment take Batman fans on a journey into the iconic past with the full-length animated Batman feature film - Batman: Return of the Caped Crusaders. The film features the vocal performances of Adam West (Batman), Burt Ward (Robin) and Julie Newmar (Catwoman). Batman: Return of the Caped Crusaders will be available November 1, 2016 on Blu-ray Combo Pack and DVD. Batman: Return of the Caped Crusaders will be available to own on Digital HD starting October 11, 2016. It's back to the 1960s as Batman and Robin spring into action when Gotham City is threatened by a quartet of Batman's most fiendish foes - Penguin, The Joker, Riddler and Catwoman. The four Super-Villains have combined their wicked talents to hatch a plot so nefarious that the Dynamic Duo will need to go to outer space (and back) to foil their arch enemies and restore order in Gotham City. It's a truly fantastic adventure that will pit good against evil, good against good, evil against evil ... and feature two words that exponentially raise the stakes for both sides: Replicator Ray. Holy Multiplication Tables! Adam West steps behind the microphone to bring Batman to fully animated fruition. Burt Ward joins the fun as Batman's sidekick, Robin, giving The Boy Wonder his voice in animated form. And Julie Newmar, star of stage (Tony Award winner for The Marriage-Go-Round) and screen (Seven Brides for Seven Brothers), dons her feline ears to bring Catwoman to life. Rick Morales (LEGO DC Comics Super Heroes - Justice League: Cosmic Clash) directs from a script by Michael Jelenic (Teen Titans Go!) and James Tucker (Justice League vs. Teen Titans). Tucker and Jelenic also serve as Supervising Producer and Producer, respectively, on the film. Sam Register, Benjamin Melniker and Michael Uslan are Executive Producers. Take a look at the new trailer, along with the Blu-ray artwork for Batman: Return of the Caped Crusaders.